Where nothing you know is set in stone. Ever since humans as we know them have existed, they have migrated across the globe. This migration started a mere 200,000 years ago from the very continent that nowadays is facing the greatest limitations in its travel capacities: Africa. One can't help but wonder how this has happened, why, and what effects this might have on the continent's cultures. When describing cultures, we think of the ideas, customs, and social behaviour of a particular people or society. These cultures are neither static nor constant but rather fluctuate over time changing through each interaction with other cultures and its people. We've seen this in the story of the Romany Gypsies as well as contemporary Western cultures - as people explore beyond their physical and mental borders they bring with them their stories, their music and their arts forever affecting their new environments leaving a lasting mark. Although this might sound brilliant, we should not forget that travelling beyond your physical and mental territories is, for many, still a luxury. One that signifies independence and therefore freedom - freedom to move, freedom to speak, freedom to think. While we find comfort in the idea of living in a so-called free world, a quick comparison of passports harshly shows us that truly free are those who own one of a First-World country. And that those born in the Third-World, are inclined to remain there. However, the extent to which this institutionalized restriction on physical mobility impacts the creative fields - fields renowned for and associated with the freedom of creation, thought and speech - remains unclear. What is this divisive message that’s being spread through denied visa requests, discriminatory border controls and inefficient bureaucracies? In our utopian quest for a creative playing field that is levelled out globally, we are going to try and find out exactly how this inequality in mobility shapes our cultural landscape. In the process of this research, we'll explore the many facets of mobility which is not merely limited by the physical aspect but also encompasses the mobility of knowledge and financial mobility. We will take this opportunity to research the very infrastructures that allow for creative knowledge and free-thought to spread and the restrictions sabotaging it. How has mobility and its restrictions shaped our cultural landscape? To what extent is this landscape a proper representation of its regions? What role does the internet play in facilitating the mobility of knowledge and therefore the shaping of culture? What can creators, curators, organizers and policymakers do to minimize the social gap within their communities maximizing financial and therefore creative mobility? In the months following up to Atlas Electronic’s fourth edition as well as during its programming in August 2019, we will reflect on these issues raised by people in the field along with existing solutions. Kamaal Williams aka Henry Wu is spearheading the thriving scene that’s grown out of London’s young, jazz-influenced musical circles. Mingling a variety of the genre's traditions with broken beat, house and garage, the London keyboardist developed a hyperdynamic sound bursting of poly-rhythmic sounds and spheres. The Palestinian Jazar Crew started to throw their own parties against all odds to provide safe spaces for Palestinian youth away from the prying eyes of conservative Palestinians and Israeli authorities. With their club in Haifa named Kabareet, they've shown the world that There Is Life Underground. The African Music Archives (AMA) is a uniquely extensive collection of sub-Sahara African music, containing anything music-related from vinyl-records, audio- and video tapes, CD's, DVD's, to newspaper clippings with articles, reports, interviews, reviews and more. The approximately 10.000 sound carriers of which some of them are dating back to the '40s, represent almost any sub-Saharan country. Moroccan-born and Brussels-based, GAN GAH tells a story many could relate to. 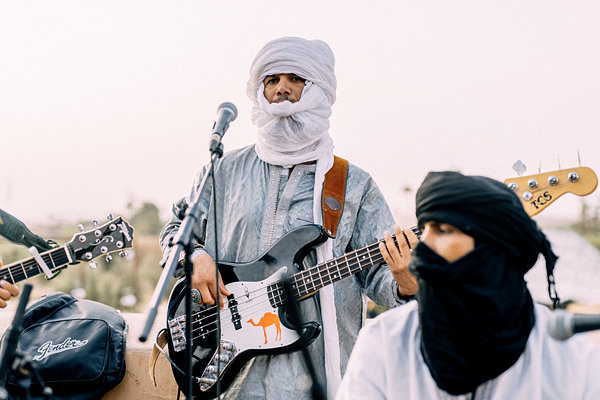 Both in his DJing and his productions, he's found a way of feeding his Agadir roots, Gnawa and Amazigh territories, into modern electronic music, fusing not only sounds but cultures alike. Houariyat or B'net Houariyat - which translates to 'Girls of the Houara' - is a group of five women who perform traditional music from their native region through singing and dancing. Their story started as one of the women who made music from their homes because they weren't allowed to perform in public spaces. Now, this female group uses their uplifting music to spread a message of empowerment using humoristic approaches to daily scenarios surrounding the lives of women. Multimedia artist and Central Saint Martins graduate Lina Laraki's practice is shaped by a variety of media like image, sound and installations. In her work, she explores emotions and aesthetics related to the cinematographic apparatus by questioning the roles of space, narration and spectatorship. In order to create emotional resistances towards a more tender art, the Moroccan artist plays with movement as both a language and a gesture. Noticed by some memorable DJ and live performances, the discreet producer developed through the years a strong passion for creating a sound experience that challenges social and cultural barriers and moves people to explore perspectives beyond the dominant trends. This dedication is translated into the curation of the Moroccan label Casa Voyager. Olfa Ben Ali is an award-winning Tunisian-French visual artist. Olfa is part of a new generation of creators that is strongly rooted in Western Europe but which historically and emotionally relates to North Africa. Using language, her own experiences and minority discourses as tools, she questions the relationship between contemporary migration issues and colonial history. Her work is intimate and poetic while at the same time political and full of contrasts, guarding a strong sense of humanity throughout. Re|fuse is an avant-garde magazine with the soul of an artist and the face of a refugee. It hijacks the language of fashion to encourage an honest and passionate exchange mediated by visual art among people who were brought together under extreme circumstances. Re|fuse is based on an original idea by Olfa Ben Ali, whose roots extend in Europe and Africa, that the continents that are brought together by the Mediterranean Sea. This same sea that on most people's minds is linked to vacation sites has become the silent witness of the crossing of thousands of refugees to Europe.The people who are stripped of their dignity as they are asked to hand over their wet clothes to the boarder police when they reach the Mediterranean shores. Re|fuse sees in these clothes a flow of inspiration: trends, styles that come out of places like Aleppo, Khabul and Baghdad emerge as a kaleidoscopic image of fragments of stories and images of the people who dare to dream in the face of tragedy. Frankfurt and Berlin. Their aim is to renew the perception of non-western subculture. RE:BOOT is in close cooperation with Europe's biggest African Music Archive, called AMA. 1950s to South-African kwaito Records from the 1990s. the archive in combination with contemporary dance productions which are based on non-western rhythmical influences. For this moroccan-born DJ, raised in Casablanca, sharing music has always been a core mission to her identity. Yasmean has this ability to set the mood and translates her energy into record selections, where genres and influences are blended for the common good of her crowd. She has laid-down her energy on several high-profile radio stations such as Rinse FM, Berlin Community Radio and Red Light Radio. She embodies confidence behind the decks and her cutting-edge approach of Djing makes her one of a kind in the moroccan scene. Her style balances between a ferocious appetite for heavy bass, IDM, junglist rollers and splintered techno. She also has a soft side that she highlights throughout ambient music and soothing, healing melodies she likes to call « her therapy ». Noritsu is a moroccan young artist who grew up in France in the mid 90’s. She has been witnessing all the uproar around the hip hop culture: Graffiti, new rap music icons and the hood rules staged in some historical turnpoints of french hip hop such as Iam, NTM or Les Sages Poètes De La Rue. This all culture has been for her about freestyle. And she made a motto out of it : «I will freestyle my way out » she answered to her parents when they first asked her what she intended to do with her life. And somehow they could see where she got that from : she has been listening to the synthesizers sound of raï and has been dancing with her sister on Cheb Hasni tracks before she couldn’t even walk. Her musical inspirations are just as wide as her thirst for the world. Electronic music, hip hop, funk, soul, bossa nova, italo disco, north african vibes, or the turkish bluenote that is so popular in turkish-german coffees. Her classical influences goes from Gil Scott Heron, Sade, Nina Simone, Freddie hubbard, Herbie Hancock, Roy Ayers to Oum Khalthoum, Warda and Nass El Ghiiwan. Noureddine Ezarraf is a writer, poet, translator, performer and photographer from the medieval Berber town of Aghmat (Morocco). Ezarraf’s work is an attempt to explore the poetics and the practice of poetry, by questioning oneself on the medium, trying to go beyond the frames which define the contours of this artistic practice. Maria Daïf was born in 1972 in Casablanca. She is graduated in French literature and in psychoanalysis applied to the literature. She started her journalistic career in 1997 by joining the first monthly feminine and feminist magazine of the country. She spent more than 15 years in moroccan media as a journalist and chief editor, specialized in art and culture. Eager for innovative adventures, she began in 2005 to accompagn artistic projects in council and press relations. She was a member for more than 5 years of Young Arab Theater Fund's selection committee as well as of the Art Moves Africa selection committee. Her professional adventures have a common engine : the conviction that the access to art and culture is a human right. From December 2015 to october 2018 she managed the Touria and Abdelaziz Tazi Foundation, a private fund dedicated to support art and culture in Morocco and its space L’Uzine, in Casablanca, Morocco. The two institutions are now considered as some of the most important cultural operators in the country and the MENA region. Studied Houariyat / how (traditional) female artists are positioned in Morocco. Born in Marrakech, VOST lives between Morocco and France, more precisely Marseille. Discovering a love for electronic music through ED Banger records' highly energetic releases, VOST's mindset of rebellion against conformism and obedience has been nurtured in the punk rave scene of Southern France in which he has been active playing and organizing punk rave parties. He mixes the industrial, noisy and desolate electronic beats of his DJ sets in a way that is a statement of rebellion against blind slavery to the system, and most importantly a longing for freedom and raw love for high octane and energetic music. Nassim Azarzar’s work approaches philosophical and historical questions through a range of visual forms, media, and social engagement. Focusing on natural patterns and their relationship to the history of Islamic art, similitude in structures and scale, old and new printing practices, and genealogies of aesthetics, his work challenges the paradigm of modern art and of modernity itself to trace the movement of shapes and patterns across contexts, and through time and space. He is as much inspired by natural structures observable in nature, and by Alan Turing’s mathematically modeled approach to natural forms, as he is by the genealogies of shapes and patterns that characterize the history of Islamic art and Moroccan art. Observing the movement of art in new social and cultural spaces, and onto novel surfaces and materials in cities and urban spaces, he builds upon the ideas promulgated by Moroccan artists and intellectuals in 1960’s meant to disentangle colonial history from modern Moroccan art. Moving from the museum to the streets, Azarzar now takes inspiration from new aesthetics that emerge hand-painted on the facades of storefronts, in typographies found adorning large trucks, and as forms of design that shape the everyday visuals of contemporary Morocco. Thinking with the idea of entropy, his work traces the movement of visuals across media, surfaces, and materials in order to inquire into the power of aesthetics and images in the contemporary world. Half Taiwanese-half french and currently based in Paris, made a name for herself by promoting parties since 2012. Originally starting off as a hip-hop and R&B DJ, Louise has grown up with sampling culture and been a crate-digger for a long time. Her endless quest looking for soul, funk, disco and jazz has led her to build her own sound when playing clubs like Rex and Concrete. In 2018, she released her first track, a rolling tune that reflects Louise's take on Horny House - "Reach" came out on Moxie's On Loop label and Compilation. Today she hosts radio shows on Le Mellotron, Rinse France, The Lot Radio in New York, Radio Nova & DJs alongside acts like Floating Points, MCDE & Bambounou. Jayson Wynters is a DJ that is able to combine many genres in one set and make it work. Wynters was first known as a garage MC in Birmingham, before rising to prominence in the city’s underground radio and club scene, where he showcased an impressive..It was in 2015 that Wynters began to really stand out from the rest, with a particular techno legend taking notice. None other than Mr G had found himself a protégé and announced he was signing Wynters to his own label Phoenix G. Mr G’s first release of 2016 was Wynters EP 'Unfamiliar Territories', a 4 track record that is hazy, technoid and threads into deep territories. This is also only the second time Phoenix G has released a record that isn’t from the label founder himself. Understandably, it has taken something rather special for this exception to occur. Wynters music exemplifies his perspective, and therefore his collection of life experiences—the ups, the downs, good times and not-so-good times. Using music as an outlet for expression, whether in the form of DJing or having fun on some drum machines and synths, is one of the most defining features to Wynters. He continues to fuel his passion by keeping an eye on the future rather than the past and striving to remain different. ➣ For the fourth time in a row, Atlas Electronic will be held in its home away from home: the environmentally friendly eco-lodge, Villa Janna. Some of you might know this place like the back of your hand by now. But for those of you who don't, let us walk you through our one-of-a-kind festival site. 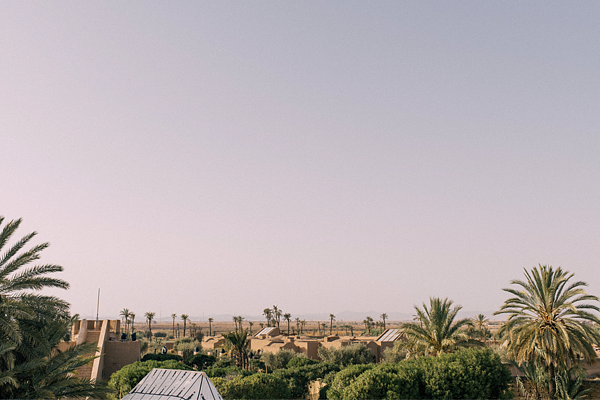 Villa Janna is an eco-lodge built just outside the lively city of Marrakech. Situated in La Palmeraie - a palm grove counting over 100,000 palm trees - it is the perfect getaway. An adventurous off-road trail takes you further away from the familiar, leading you to an ancient looking building. Its round features arising from the desert-like plain are characteristics that, once seen, instantly become the landmarks for your navigation. The award-winning location is applauded both nationally and internationally for its architecture and durability. In 2016, it won first place for durable tourism in the context of the twenty-second session of the Conference of the Parties (COP22) - an annual conference on climate change held by the United Nations. Villa Janna also holds the 2016 Terra award for its contemporary architecture from raw earth. But hold on. This eco-lodge from red clay is Africa's largest of its kind, making it the ultimate location for our intimate festival. It's four days a year that Villa Janna is transformed into a stunning festival site able of hosting up to 2000 people. Each of its three stages in unique in its own way. From the rooftop stage with panoramic views to the ancient Roman-inspired Amphitheatre and laidback Pool stage, surprises lay around every corner. Take your time to roam the premises and explore the various hidden rooms and areas. Be inspired by the Atlas Art Village, sign up for one of the workshops or join the panel discussions. One ticket gives you full access to the festival programme. Including elaborate art-programming, talks, workshops and panel discussions. One ticket gives you full access to the festival day and night programming on Thursday, Friday, Saturday and Sunday. Including an elaborate art-programming, talks, workshops and panel discussions. One ticket gives you full access to the festival day and night programming on Friday, Saturday and Sunday. Including an elaborate art-programming, talks, workshops and panel discussions. Note: this ticket is not valid on the Opening Concert on Thursday September 29, 2019. Valid for 4 persons | One ticket gives 4 people access to the full festival programme. Including elaborate art-programming, talks, workshops and panel discussions. Your Atlas Electronic Experience package includes festival tickets, opening concert tickets, daily yoga sessions, daily breakfast, one hammam treatment per person, festival pick up and drop off as well as 4 nights in an onsite camp made up of nomad tents with the necessary comforts. ➣ Where is the festival? 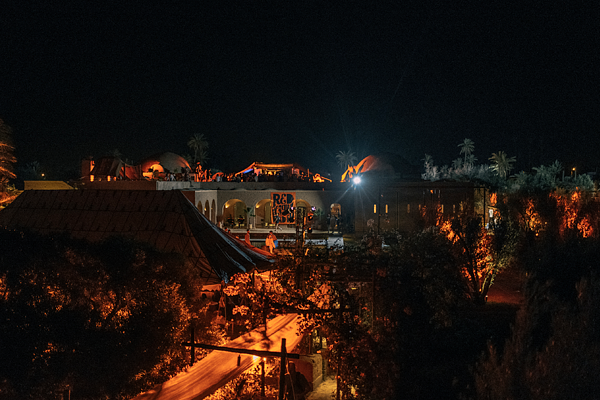 The Opening Concert and Festival of Atlas Electronic are being held at Villa Janna Ecolodge located in the Palmeraie area of Marrakech. The address of Villa Janna is Douar El Mghazli CR Al Ouidane, BP Guéliz 2691 - 40000, Morocco. ➣ What are the opening times? Thursday Opening concert with limited access. The campsite is open from August 29th 12:00 until September 2nd 12:00. The timetable will be communicated a few weeks before the event. ➣ When is the Opening Concert and/or the festival? We’ll start the journey with an Opening Concert on August 29th. Thereafter we continue with three days of the festival between August 30th until September 1st of 2019. ➣ What's a Festival Passe-partout ticket? A Festival Passe-partout is a ticket for three or four full days of the festival. This ticket will give you access to the festival from August 29th (Thursday) or 30th (Friday) until September 1st (Sunday). The Opening Concert is included in the different ticket tiers. The capacity is very limited so don’t wait too long with purchasing your ticket. ➣ How does the deposit payment work at Fixers Worldwide? Purchases can’t be changed unless there is proof of a valid reason. In such a case, please contact our team: info@atlas-electronic.com. ➣ I'm 17 now, but my 18th birthday is before the festival. Can I buy a ticket? As long as you’re 18 by the time you pick-up your wristband, you may purchase a ticket when you are 17. Just make sure you bring your I.D. along – all customers are ID’d regardless of age. ➣ What's The Atlas Experience - Nomadic campsite package? We are offering a limited amount of experience packages which include tickets to both the festival and opening concert, four nights in a luxury nomad tent on the campsite, daily breakfast, yoga, access to private concerts, a relaxation treatment with hammam and massage, unlimited dips in the pool and of course pick-up and drop-off with the Festival Shuttle Service - Location in the center. ➣ What access do I have? With a Festival Passe-partout, visitors have access to the festival from the 29th August until the September 1st of 2019. You will have access to all public areas. To enter the campsite you must have a valid Full Atlas Experience ticket or a separate add-on Camping ticket. ➣ I can't go anymore. Can I refund my ticket? ➣ Where do I buy a ticket? You can purchase your ticket in the ticket shop of Fixers Worldwide. Moroccan? Use an international credit card or contact us via our online-form to apply for it. One of the ambassadors will contact you to make the transaction. ➣ Can I change my package after I have paid? ➣ Payment failed. What now? Did you fill in all the information correctly? Still not working? For everything regarding the tickets and the ticket shop, it is best to contact the service directly by going to https://help.fixersworld.com. ➣ What's the best way to get to the festival? We advise you to use the Festival Shuttle Service from the city centre or designated hotels. Schedules of the shuttle service will be announced 2 weeks prior to the festival. ➣ Is there a good taxi service? We advise you to use our Festival Shuttle Service or plan your ride carefully in advance when you’re new in Morocco to avoid extra costs. Our Festival Shuttle Service schedule will be communicated before the event. ➣ Where do I sleep? We advise you to book a spot on the campsite to avoid the hassle of commuting. However, we are working on ways to offer hotel deals, which will be communicated when available. ➣ Do you have other options for accommodation? Currently, there are no other options outside of the On-site Camping. This may change in the coming months. ➣ Can I get a package for one person? Unfortunately, packages come in pairs (two-person or four-person packages). Travelling alone? Get yourself a Festival Passe-partout or find someone to share a tent with on our facebook page. ➣ Do we get a private tent? Yes, we have tents for 2 persons and 4 persons. ➣ When does the campsite open? When can I check-in? The campsite is officially open to Atlas Electronic visitors from Thursday 29th August 12:00 until Monday 2nd of September 12:00. ➣ Can I bring my pet? Pets are not allowed anywhere within the campsite and festival grounds. Access will be denied at the door. ➣ Can I take a shower? Yes, there will be showers available for our camping guests. ➣ What can/can't I bring to the campsite? Illegal substances are strictly prohibited at the festival. Any person found in possession of such substances will be denied entry and/or removed from the festival. You are allowed to bring two litres of alcohol and unlimited food and water to the campsite. Note that this is possible only upon arrival. However, there will be enough bars/food corners where you can get reasonably priced food/drinks. ➣ Can I bring a Campervan into the campsite? Please send an email to info@atlas-electronic.com to discuss. ➣ How do I get in touch with the PR person of Atlas Electronic? Please send an email to info@atlas-electronic.com. ➣ I have a suggestion and would like to get in touch with the organization. ➣ How do I get in contact for everything regarding tickets? It's best to visit https://help.fixersworld.com/ or email to hello@fixersworld.com. By entering the festival grounds you are agreeing that you have read and understood these house rules and agree to comply with and be bound by these house rules. The house rules are subject to change, the most up-to-date version of the house rules that will apply will be available at the gate of Atlas Electronic. If visitors do not abide by the Atlas Electronic house rules, they can and will be removed from the festival area. We don't allow any kinds of soft and/or hard drugs or research chemicals. If you have (prescription) medicines you need to bring with you, please email info@atlas-electronic.com and we will discuss the appropriate procedure. Follow instructions by Atlas Electronic staff and security at all times. Security personnel can search visitors. Refusal to undergo a search will result in expulsion, without a refund. Visitors are to abide by decisions made by security personnel at all times. These decisions could relate to carrying and/or bringing in materials, food and equipment or the validity of entrance tickets. Atlas Electronic staff will always have the final say in these matters. The sale of t-shirts and other souvenirs, as well as foods and drinks, is prohibited. Distributing flyers, posters, banners and/or stickers is not permitted – neither at or around the festival area, nor at the hotels and the nearby roads. Sampling is not allowed, either. Lighting a fire or BBQ is strictly forbidden. At the request of Atlas Electronic’s staff, security or otherwise, you will have to show your ID to confirm your age. We might also ask for your ID at the bar. The legal drinking age in Morocco is 18 years. We reserve the right to make changes in the festival programme and/or timetable. - (Semi-)professional equipment, such as photo, audio, video or recording equipment, including GoPro. These can be confiscated upon entrance. The Moroccan currency is called Dirham (MAD). For certain side-activities, you will need cash. However, the majority of the purchases at the festival (e.g. food, drinks, and shisha) are paid with AE Tokens which can be purchased with cards or cash after entrance. ➣ Can I exchange a foreign currency for Dirham (MAD) on-site? No, you can’t exchange any foreign currencies to Dirhams. ➣ Why do you use AE tokens payment service? This service ensures the quickest and safest way of paying at the festival. ➣ Where can I get my wristband? You will get your wristband when you enter the festival site. Note that you only get one wristband. Keep this wristband on at all times. ➣ Will there be any ATMs on-site? Yes, there will be ATMs on the site. But we do advise you to bring enough cash. ➣ What is the price of the drinks on-site? One AE Token will be worth around 30 Dirham.